Rice pudding. Staple of an old fashioned nursery menu. Arguably this rather plain pud has not received the best press. Considered somewhat dull, boring and most damningly of all, reminiscent of the pinnacle of culinary ambition (! ), the school lunch. Servings of cold, gloopy rice pudding were unceremoniously slopped into your bowl from those ginormous industrial-sized metal trays, a nugget of rubbery, plastic strawberry jam perched on top. Delightful. But the humble rice pudding has enjoyed a bit of a renaissance in recent years (see also classic puddings such as the roly-poly and treacle sponge). And it's been spruced up too. There are chocolate versions, boozy varieties and, for pure indulgence, extra, extra creamy puds. A world away from the noisy, boisterous, cabbage-smelling school canteen. 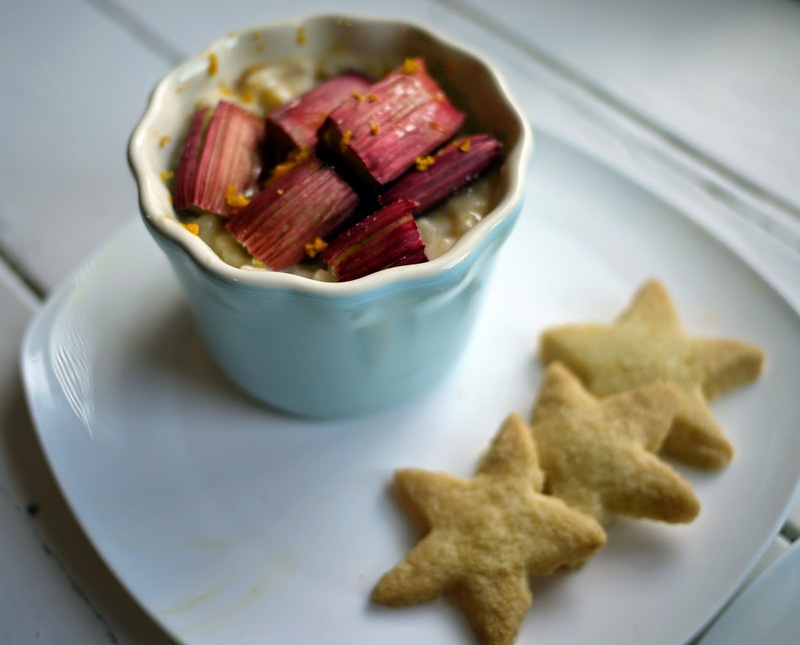 Adding to the mix is this seasonal version: Roasted Rhubarb Rice Pudding with Orange Shortbread. 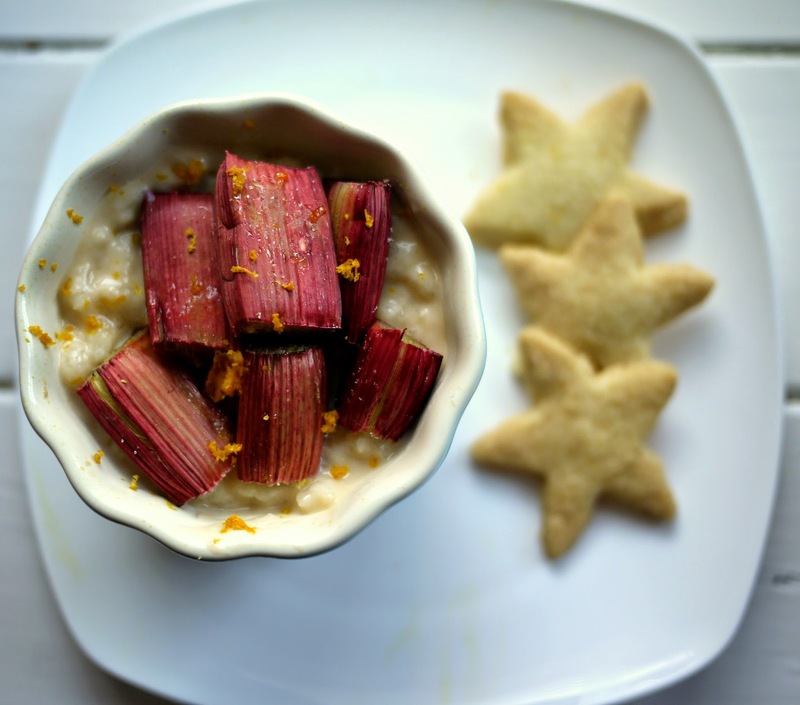 A thick, creamy, comforting rice pudding is served with tart, roasted rhubarb and melt in the mouth orange shortbread biscuits. 4. On a floured board, roll out the dough to 5–6mm thick and cut into star shapes. 5. Transfer the shortbreads to the prepared baking sheets lined and bake for 15–20 minutes until golden. Cool for 10 minutes before transferring to a wire rack. 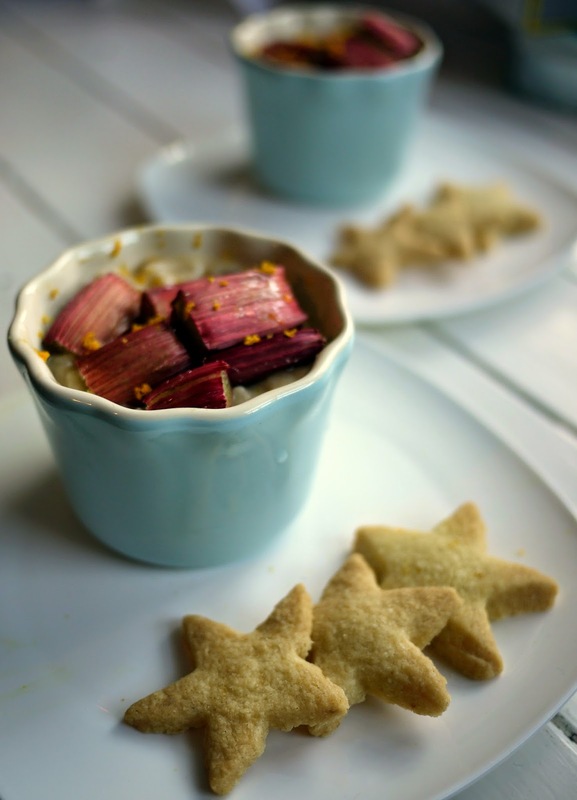 You had me at 'rhubarb' - looks utterly delicious! Thanks Catherine- it received top marks from my testers! Love the addition of the orange shortbread! Yum! What a great idea. The shortbread was originally planned for another recipe, then I had a eureka moment and thought to add it to the rice pudding! I love rice pudding, Jamie Oliver has tried darnded hard to bring back this winter pud and has done pretty well too. I might add I was one of those dinner ladies dishing up creamy rice pudding to hundreds of primary school children in the 80s and mine was delicious although I had to admit the jam was a bit fake tasting. I love those little star biscuits on the side too a lovely touch. Dinner ladies play such a vital role in so many respects in the education and foodie lives of all children- did you enjoy the role? Although our rice pudding we had in school doesn't sound half as tasty as yours, they made a mean roly poly pudding that we'd all want to have each day! Haha- thanks Hannah! My mum have me a whole bunch from the garden to bring back one weekend so I too have been experimenting with all sorts of different rhubarb dishes! 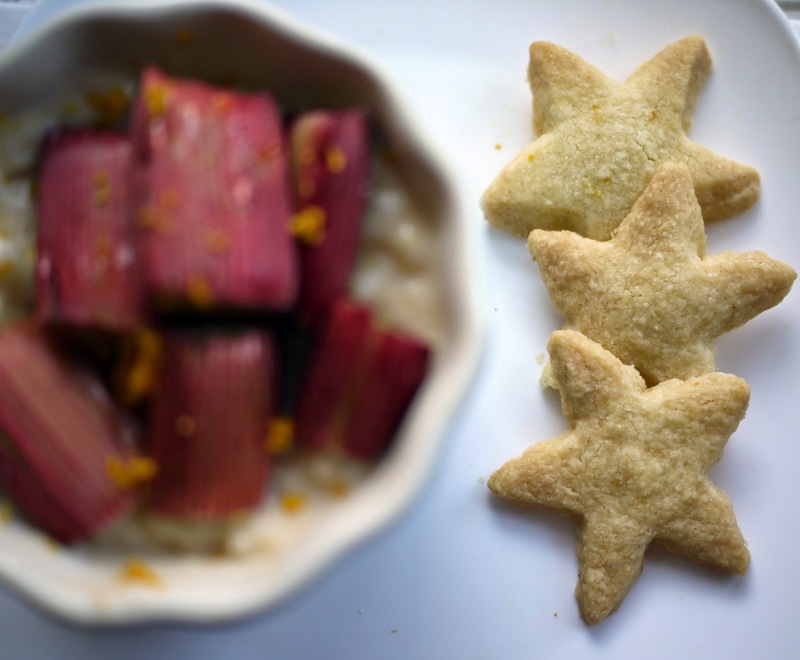 The BBC Good Food have a brilliant recipe for rhubarb and custard which I make each year! I've always tended to avoid rice pudding for the reasons you describe, but this sounds absolutely gorgeous! Anything with rhubarb is a winner for me. Thank you- my presentation skills are normally rather haphazard!